Christmas and New Year as celebrations usually involve a lot of good food which are normally dedicated only to this time of the year. Christmas and New Year in Spain aren’t the exceptions. Totally opposite, together with the biggest celebrations of the year people from Spain are also celebrating The Three Kings Day which is like second Christmas. In Spain there exist many different dishes which are served on the celebrations table. Some of them are very similar to the ones of other countries, however, others are for sure more interesting and at least to try! El Cochinillo or Lechón is a typical dish of winter holiday season. It contains young small pig which is still in the period of lactation. The dish is very common in many Latin American countries as well as in Puerto Rico and Filipinas. In Spain, the most famous type of the dish is El Cochinillo de Segovia. The latter differs from others in a way the little piggies are raised, the diet of their mothers. Little piggie which is used for this dish is between 4.5kg and 6.5 kg weight. When it is fried it has a crunchy texture from outside and very soft inside making the dish probably the most delicious and the most typical of the Holiday season. One of the most classic fish recipes of Spanish Christmas is Besugo al Horno. It is very simple and fast to make. The bream is baked normally with potatoes and some onion in the oven and adding a little bit of lemon depending on everyone’s taste. If it is not overdone it can be an excellent recipe of superior quality! Sopa de galets or jus pasta soup is one of the most typical traditional dishes in Cataluna and Baleares. Pasta used in the soup has a shape of snails and it is cooked inside the broth. The soup is normally served with some small meatballs which are cooked separately from the soup. El cocido con pava y pelotas translated the stew with turkey and balls and it is very typical in a region of Murcia. The balls are normally made out of lean pork and beef, with egg, parsley and pine nuts, mixed with breadcrumbs. Turkey is cooked together with potatoes, fresh bacon, a stalk of celery and chickpeas. At the beginning it looks like many things mixed together, however, trust us it tastes amazing! El pavo in English the turkey is also a very common main dish of Christmas in Spain like in many other countries. it is normally baked together with other ingredients to make it more delicious and special. Alternatively, to the meat or fish dishes, you can find stuffed squid on the Christmas table in Spain and especially in Baleares. The recipe typically contains olive oil, Spanish onion, garlic, rice, tomatoes, salt, black pepper, mint leaves, parsley, squid and tomato juice. Spain is all about sweets during the Christmas, New Years and The Three Kings. You have a great variety of very typical sweets dedicated only for this time of the year. Los polvorones or polvorón is a typical Spanish and its former colonies sweet which name comes from the word polvo meaning dust. Yes right, the texture of the sweet really is very crumply and the sweet it self is quiet heavy. Los polvorones are made out of flour, sugar, milk, and nuts as well as adding some kind of fat or olive oil. You can get polvoranes in different flavors, however, classic, cocoa, and almonds are the most typical. Los Turrones or nougat is another very typical Christmas period desert in Spain. El Turron typically consists of honey, sugar, egg white and adding almonds. The most famous Turrones are turrón blando also called turron from Jijona, hard turrón or the one from Alicante. You are also able to find Chocolate Turron which is a great alternative for the two traditional types mentioned before. Roscon is the cake which cannot be missed at any Spanish house during the Three Kings’ day. 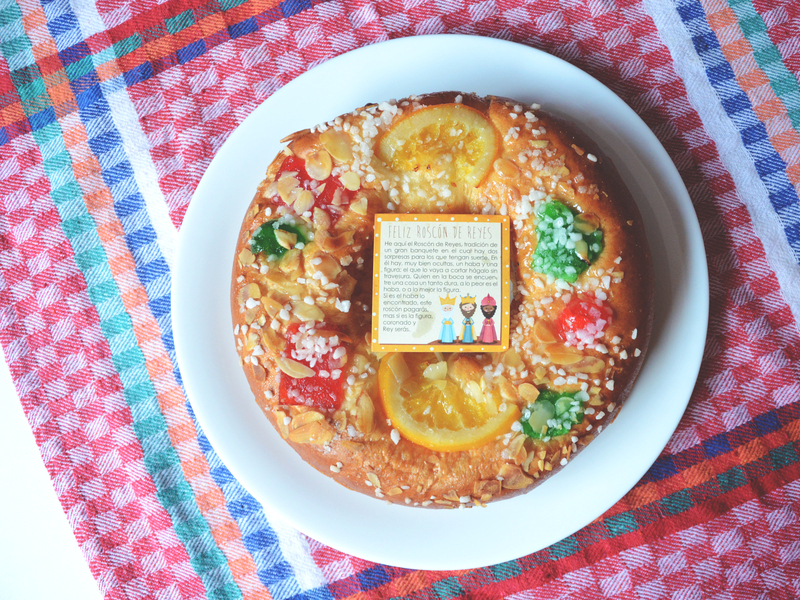 Actually, the cake is even named Roscón de Reyes or Rosca de Reyes which literally means kings’ ring. It is a ring shape biscuit cake normally containing dried fruits. Typically the bakers hide small figures inside the cake as well as the bean to make the experience even more fun. The person who gets the figure is said to be the king/queen of the day and the person who gets bean has to pay for the cake. Did you get hungry while reading this article? Wait for a few days more and you will be able to face the holiday madness in Spain!